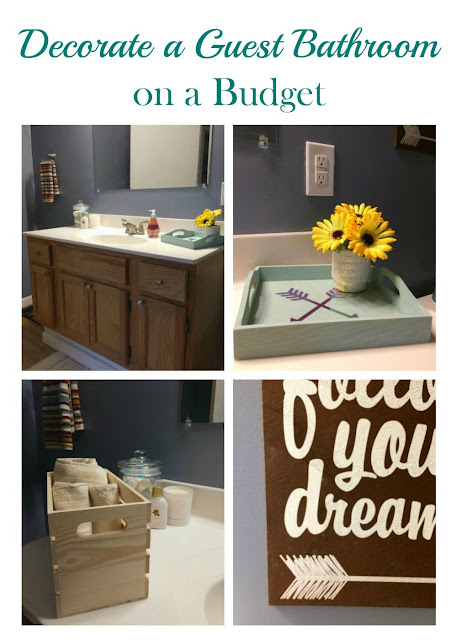 I am partnering with Oriental Trading to show you some budget friendly ways to decorate your bathroom. I honestly was beginning to think this day would never come! 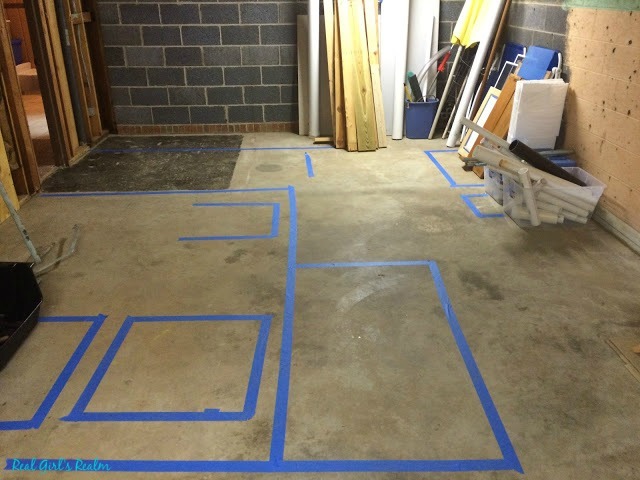 It was a little over 2 years ago when we marked out our bathroom layout with painter's tape and broke ground for the underground plumbing. Now, we have a gorgeous full bath and changing area for us and our guests that come to enjoy our pool! 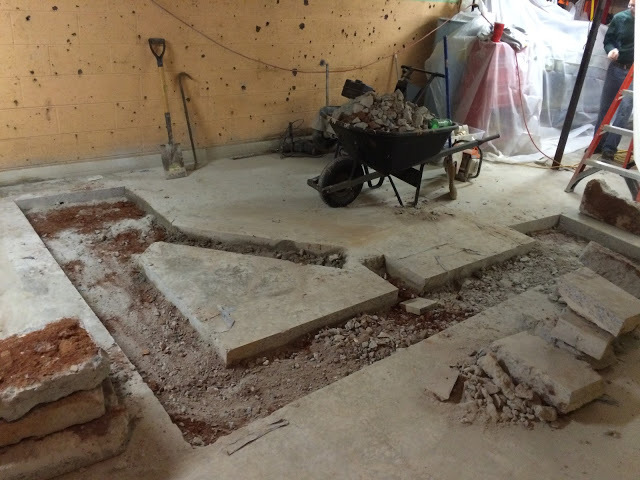 The left side of the picture is where our Laundry room is (which I will show ya'll soon!) 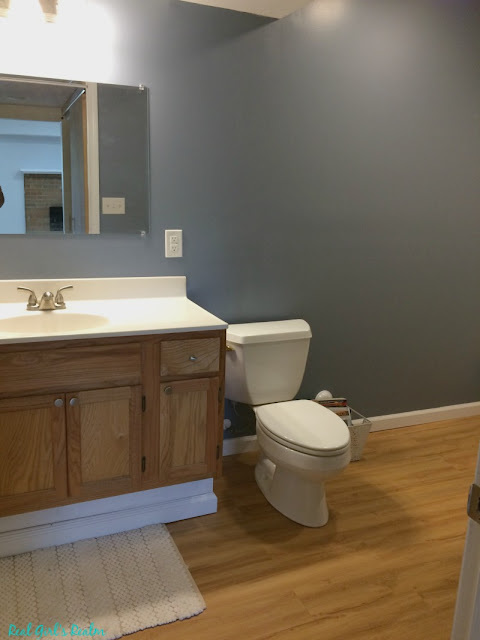 and the right side is the bathroom. Without further ado, here is our new bathroom! I had to be frugal with my decorating budget so I shopped my house, TJ Maxx, and Oriental Trading. Say what? 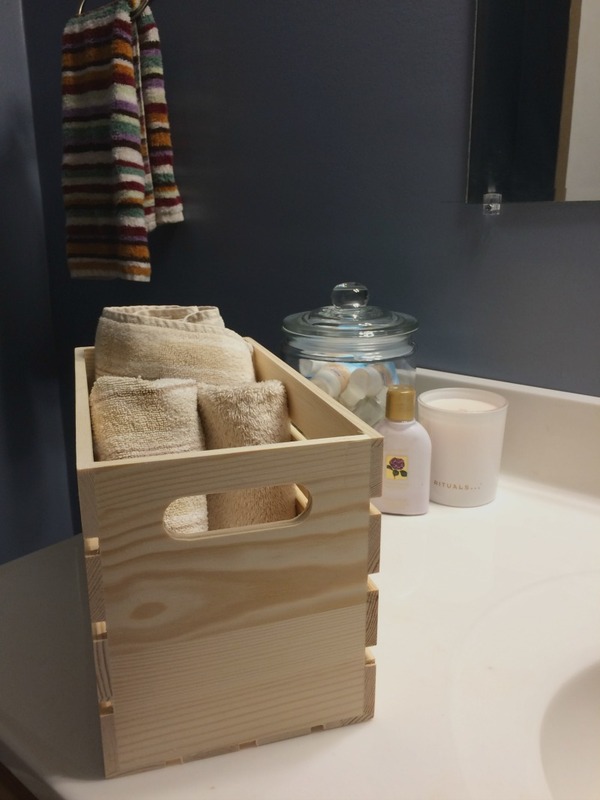 Did you know Oriental Trading carries a large selection of home decor items including wall art, glass jars and vases, wooden trays, crates, throw pillows and more!? 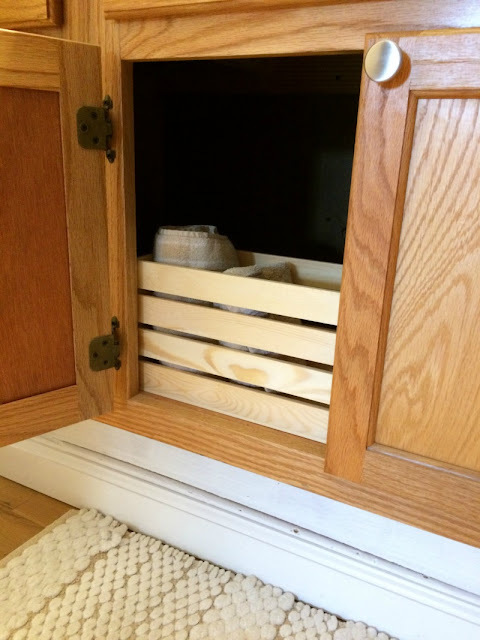 I picked out a couple of wooden crates to hold extra hand towels, wash clothes, and toilet tissue under the sink. 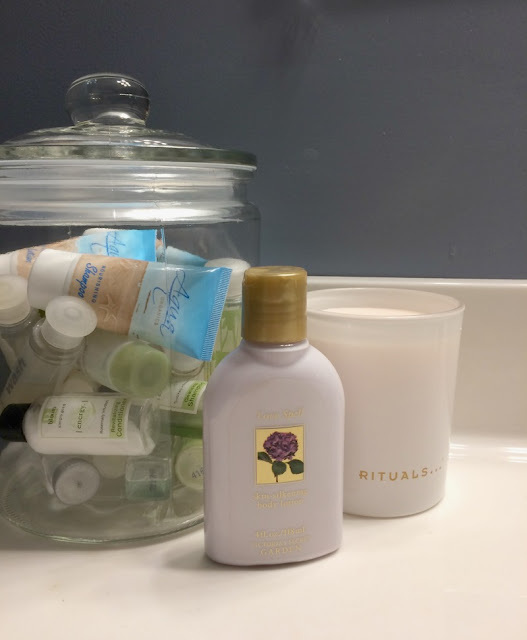 I also grabbed a glass jar to hold travel sized toiletries for my guests to use, which can easily be personalized with vinyl or paint. 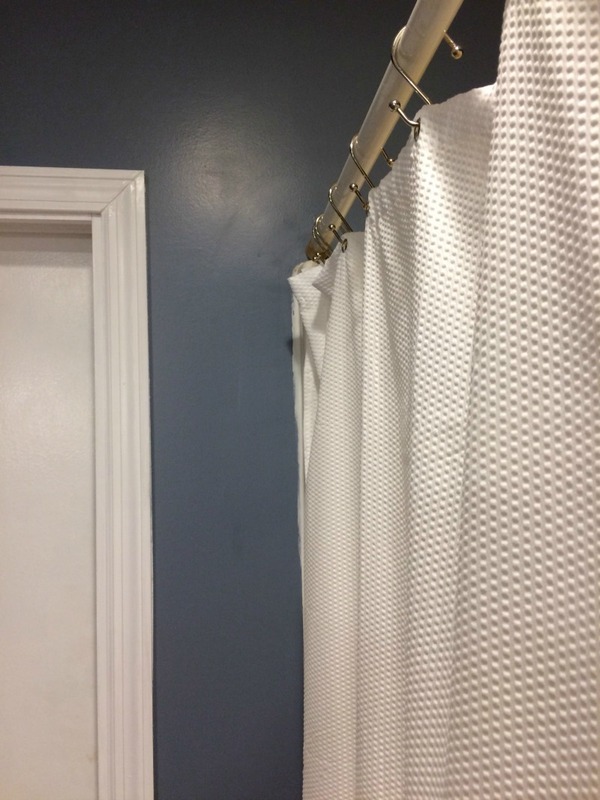 TJ Maxx is my go-to store for bath accessories like shower curtains and hooks. 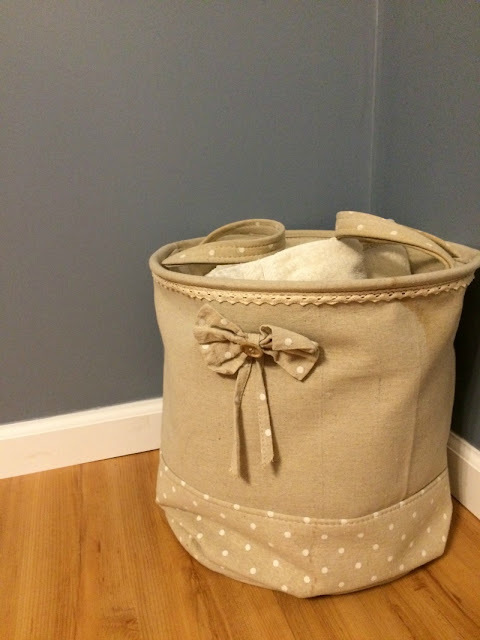 I got this hotel style waffle print curtain and pack of hooks for under $10 and a stainless steel trash can for $6. 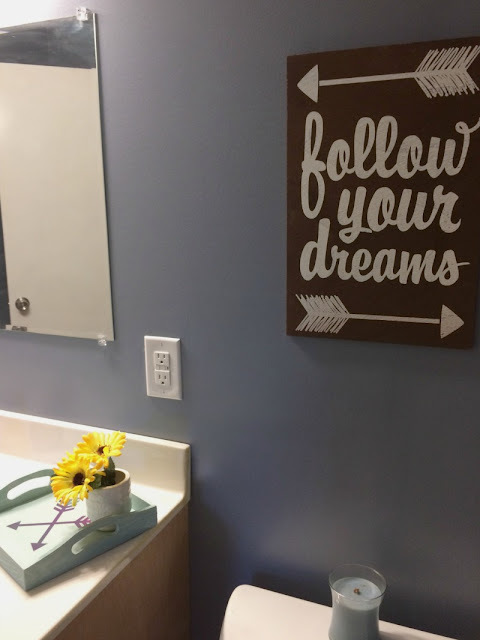 This super cute wooden sign was also an Oriental Trading find and it fills the space above the toilet nicely. 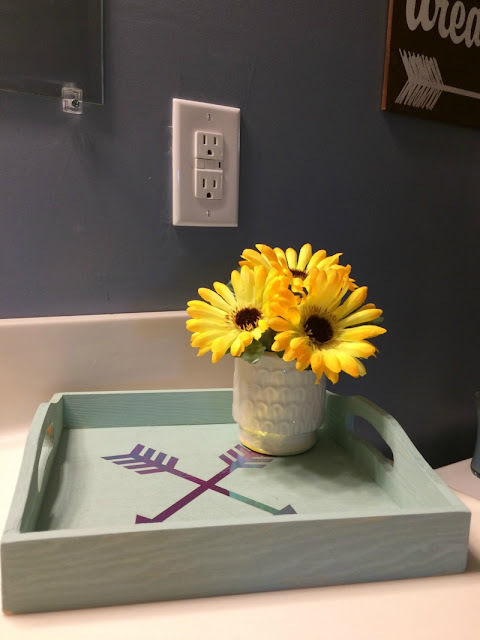 It was also the inspiration for the arrow pattern on the painted wooden tray, which is perfect for holding a small cup of flowers and a place for guests to put their jewelry. Oriental Trading sells a ton of unfinished trays, like this one. I will have the tutorial up soon for this one, but in the meantime, check out how my friend Curly Crafty Mom made over her trays! 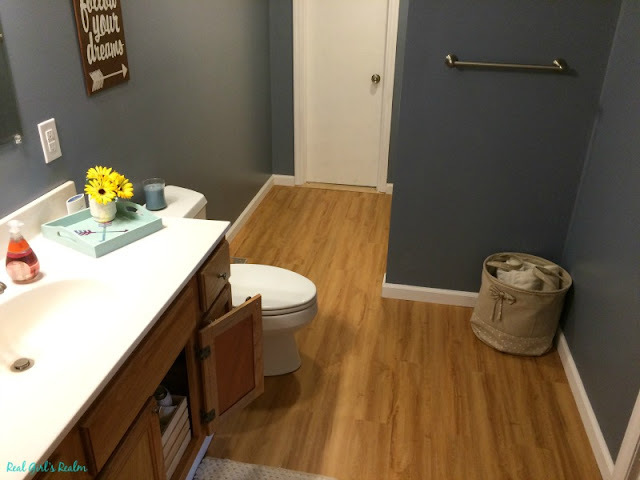 I am so excited to finally have a usable bathroom in the basement and even though I still have a couple more small projects in store to finish up this space, it's done for now! What is your favorite part of this space? Make sure to enter your email to subscribe to my posts so you do not miss any of these upcoming projects! Disclosure: I received product for free as part of Oriental Trading's Ambassador program, but all thoughts are 100% my own. 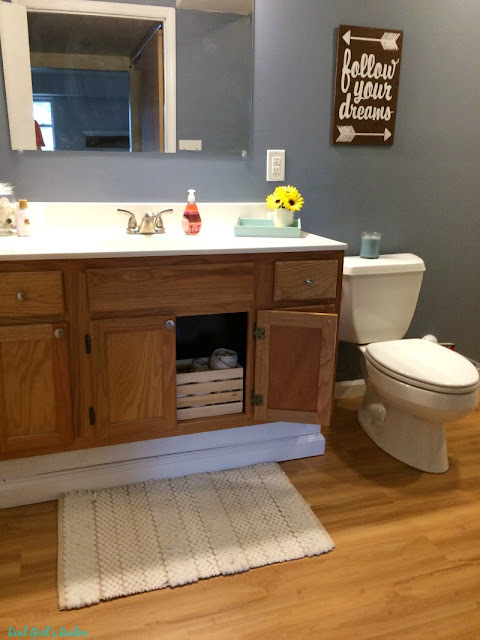 Wow -- that's amazing how you created your bathroom! Nice! 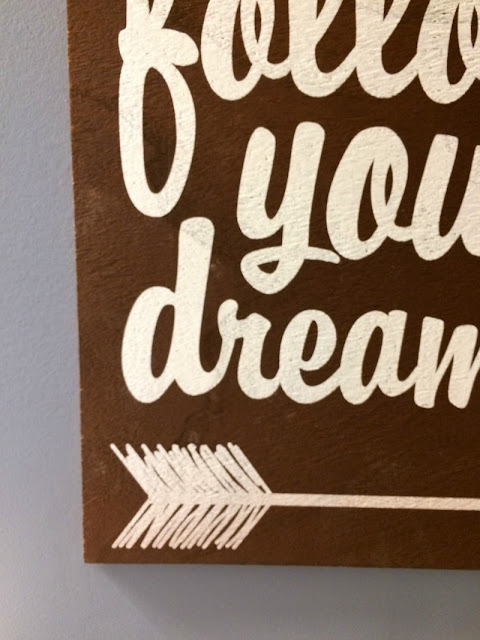 I love your decor, too. Congrats! Great job -- appreciate the work, but even more the creativity that went into this project. I particularly like the floor. Thanks for oriental trading home decor info. I had no idea! Will be checking that out. Thank you! Who knew Oriental Trading has so much to choose from! Where did you get the open top box with the slatted sides? Is that from Oriental Trading? Yes, these are from Oriental Trading!